In this Nov. 14, 2014 pool photo, Jesse Matthew looks toward the gallery while appearing in court in Fairfax, Virginia. Matthew is charged in Charlottesville with the abduction of University of Virginia student Hannah Graham, whose remains were found last year after an extensive search. In Fairfax, Matthew is charged in connection to a 2005 sexual assault. A judge has denied a defense motion to suppress some evidence in the case of the man charged with killing University of Virginia student Hannah Graham. 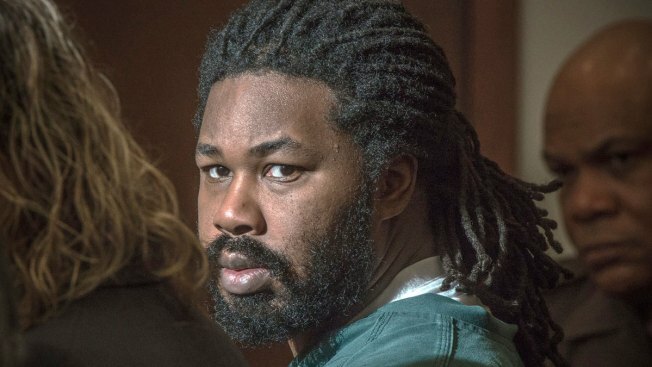 Albemarle County Circuit Judge Cheryl Higgins ruled Thursday against Jesse Matthew Jr., who is charged with capital murder in the 2014 disappearance and death of 18-year-old Graham. Matthew's attorney asked Higgins to disallow some evidence collected during a search of the defendant's apartment. The items included a cellphone, a paycheck, khaki shorts, boxer shorts, a cigar tip, toothbrushes, a wallet and a receipt. Many of those items weren't listed on a search warrant. Higgins ruled that officers exercised reasonable discretion. Matthew, 34, also is charged with first-degree murder in the 2009 death of 20-year-old Virginia Tech student Morgan Harrington. He is already serving three life terms in another case, an attempted murder and assault in 2006.